The kick-off conference for the EU COST-Action DNAqua-Net was held in the beginning of March 2017. 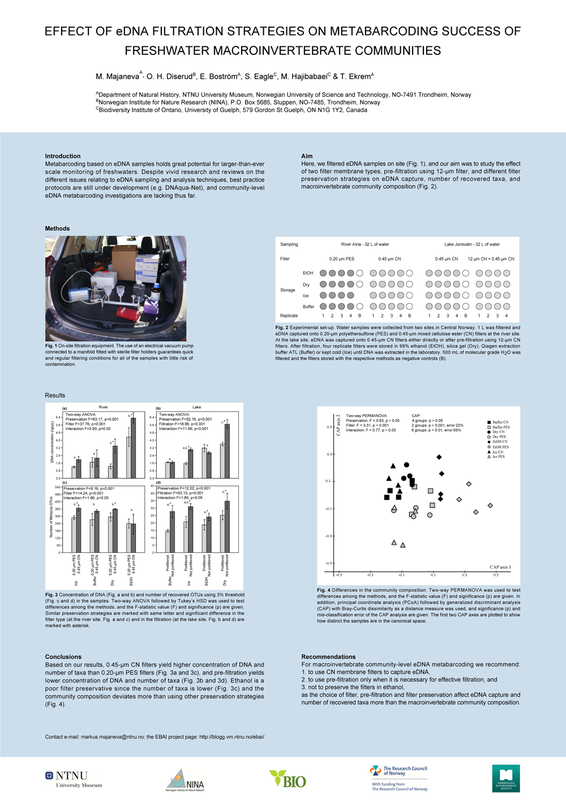 Markus and Torbjørn participated with a poster showing our results from the EBAI eDNA filter preservation experiment (see below). The conference gathered 172 participants from 37 nations and the impressive line-up of invited speakers communicated the their latest research results on topics relevant to the DNAqua-Net main goal: to develop new genetic tools for bioassessment of aquatic ecosystems in Europe. Read more about all presentations on the DNAqua-Net website. We received good feedback on our results and were encouraged to publish these as soon as possible. This we plan to do! Next article:Can eDNA be used to track changes in macroinvertebrate community composition after treatment with rotenone? How to best preserve filtered DNA? Can eDNA be used to track changes in macroinvertebrate community composition after treatment with rotenone?